This work addresses the problem of minimizing or maximizing a linear function in the presence of linear equality or inequality constraints. It provides methods for modeling complex problems via effective algorithms on modern computers. The general theory and characteristics of optimization problems are presented, along with effective solution algorithms. The text also explores linear programming and network flows, employing polynomial-time algorithms and various specializations of the simplex method. Includes many numerical examples to illustrate theory and techniques. Addresses the problem of minimizing or maximizing a linear function in the presence of linear equality or inequality constraints. Provided are methods for modeling complex problems via effective algorithms on modern computers. The general theory and characteristics of optimization problems are presented, along with effective solution algorithms. Explores linear programming and network flows, employing polynomial-time algorithms and various specializations of the simplex method. Includes many numerical examples to illustrate theory and techniques. The third edition of this popular textbook brings it completely up-to-date with the latest developments in linear programming and network flows. With an emphasis on modeling concepts, the design of algorithms, and implementation strategies, readers discover how to model complex problems and solve them using the latest technology. Following an introductory first chapter, the second chapter presents basic results on linear algebra and convex analysis, along with an insightful, geometrically motivated study of the structure of polyhedral sets. The remainder of the text is divided into two parts: linear programming and network flows. Throughout the text, the authors first present concepts and techniques, illustrated by numerical examples, and then provide further insights complete with detailed mathematical analysis and justification. Exercises from the previous edition have been thoroughly revised and many new exercises have been added. The authors' rigorous attention to detail and easy-to-follow writing style enable readers to apply their newfound knowledge to solve problems in a variety of fields, including industrial engineering, management, operations, computer science, and mathematics. Bazaraa, Mokhtar S.; Jarvis, John J.; Sherali, Hanif D.
2. Linear Programming and Network Flows, 2nd ed. 4. 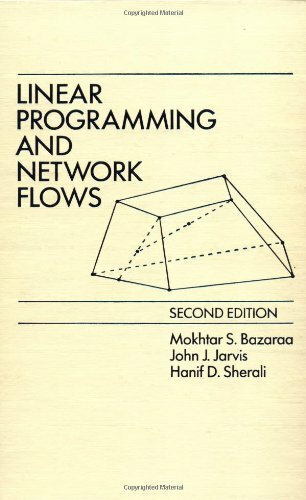 Linear Programming And Network Flows, 2Nd Ed.